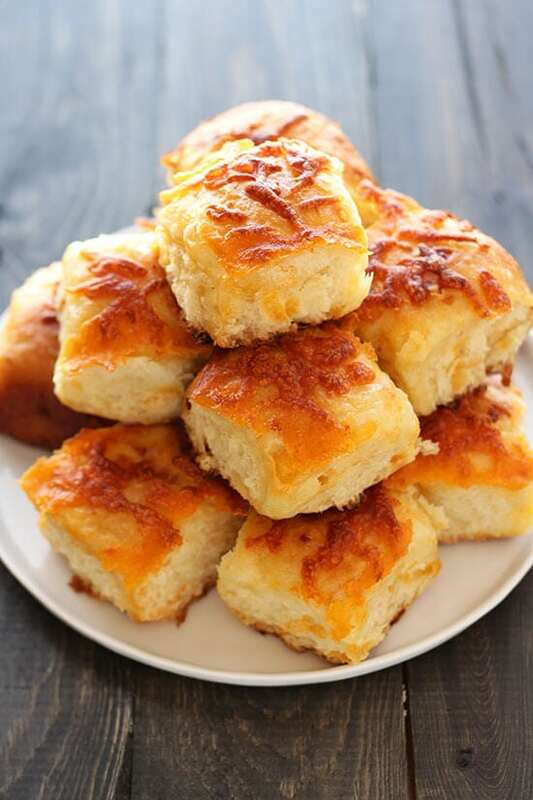 The ultimate carb lover's delight, Cheddar Potato Rolls are light, fluffy, tender, and loaded with cheese! A crowd pleaser that can be made ahead of time! Perfect for Easter. Taste: Like if everything good in the world came together in one cheesy carby bite. Texture: Light, fluffy, and tender with a perfect amount of chew and cheese. Ease: Easy enough, but a bit time consuming. Luckily the rolls can be made ahead of time at two different steps! 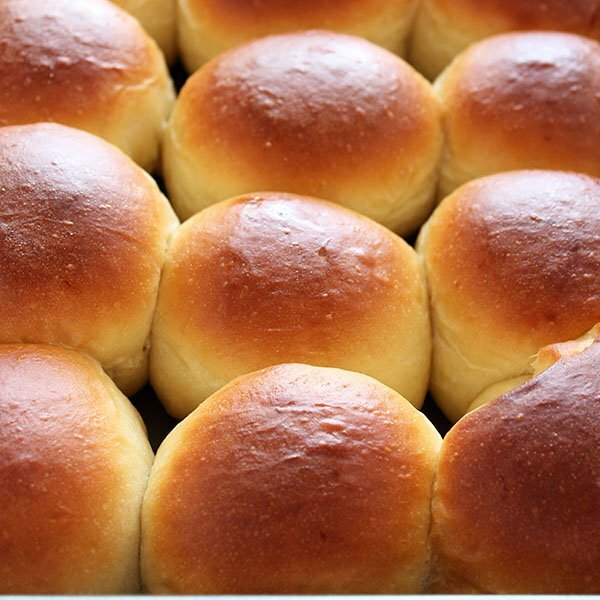 Appearance: I’d like to meet a person who could resist these beautiful rolls that practically scream your name. Pros: Wonderful crowd-pleasing bread recipe. Cons: Not an everyday fare. Would I make this again? Oh yes! Things around here have been absolutely crazy lately and when I’m feeling stressed, there’s no better relief than making homemade bread. The entire process is so soothing to me and the fact that I get to munch on delectable homemade bread at the end of it is the best bonus ever. It’s amazing to me how the simplest of ingredients can come together to make something so fantastic. If bread baking intimidates you, I think bread rolls are a perfect place to get comfortable. 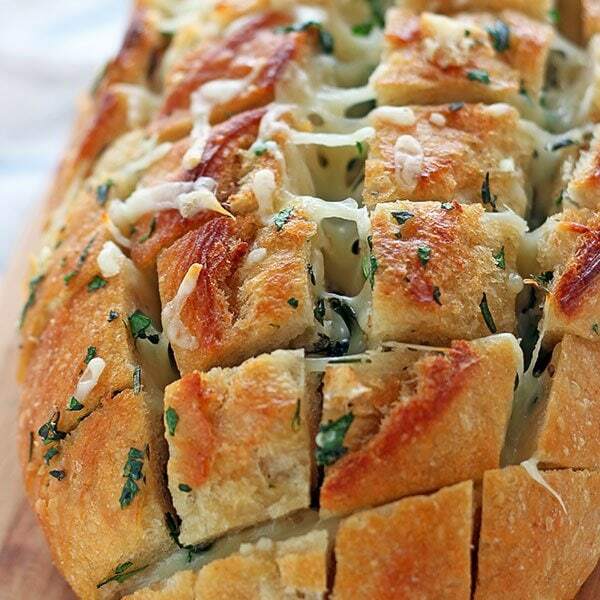 And you can’t get more motivation for making homemade bread than when both cheese and potatoes are involved! So when I saw these rolls in the latest issue of Food Network magazine I knew I had to make them. Upon first bite, I knew I had to share them with you. I’ve simplified the recipe ever so slightly and offer some bread making tips below, but the folks at Food Network always know what they’re doing! These rolls are nothing short of amazing and your family will LOVE them. They’re extra perfect for Easter, or any special occasion. You can also use active dry yeast in this recipe. Instant yeast and active dry yeast are interchangeable at a 1:1 ratio, active dry yeast just needs to be proofed with liquid before continuing with the recipe and may take longer to rise. There are two ways to make these rolls ahead of time. If you have less time now but will have more time later: after shaping the dough into rolls but before the second rise, cover and refrigerate overnight. Let sit at room temperature for 1 hour, or until puffy, before baking. If you have more time now but will have less time later: parbake the rolls, covered, for 30 minutes, then let cool and refrigerate overnight. Bring to room temperature, brush with the butter and bake, uncovered, 40 minutes, sprinkling with 1/2 cup cheddar during the last 15 minutes. This recipe is made easiest with a stand mixer but you can do everything by hand if you use some serious upper body strength and elbow grease! Since this is a fun, special occasion recipe that will be rich no matter what, I would not try to use whole wheat flour here. You may be able to get away with replacing half of the all-purpose flour with white whole wheat flour but I haven’t given that a try to know for certain. I implore anyone who likes to bake to invest in an oven thermometer and kitchen scale to measure your ingredients (especially flour). Both tools will instantly improve your baking! Love Handle the Heat? Don’t miss a recipe! Sign up to have new posts delivered straight to your inbox and receive a FREE cookbook! In a medium bowl, combine the water, yeast, and 1 1/2 cups (6.75 ounces) of the flour and stir until combined. Cover with plastic wrap and set aside in a warm place until doubled in size with large bubbles on the surface, 20 to 30 minutes. Meanwhile, prick the potato all over with a fork. Microwave until tender, 8 to 10 minutes. Let cool, then peel the potato and grate on the large holes of a box grater. Combine the butter, sugar, salt and mustard powder in a stand mixer. Beat with the paddle attachment on medium-high speed until light and fluffy, about 2 minutes. Beat in the eggs and grated potato until combined, then beat in the yeast mixture and 1 1/2 cups cheddar until incorporated. Reduce the mixer speed to low and gradually beat in the remaining 2 1/2 cups flour until the dough starts coming together in a soft, sticky ball. Shape into a loose ball and transfer to a lightly oiled bowl, turning to coat. Cover with plastic wrap and let rise until doubled in size, about 1 1/2 hours. Preheat the oven to 350°F. Spray a 9-by-13-inch baking dish with nonstick cooking spray. Turn the dough out onto a lightly floured surface and divide into 24 pieces. Shape each piece into a ball, dusting with flour as needed, and arrange in the baking dish so they are slightly touching. 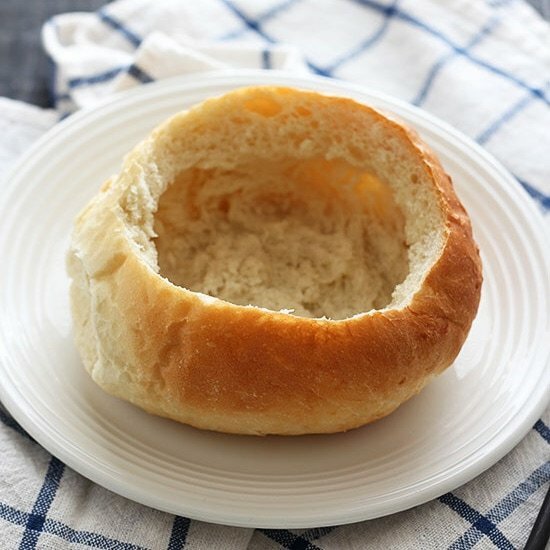 MAKE AHEAD: At this point the shaped rolls can be covered and refrigerated overnight, let sit at room temperature for 1 hour or until puffy. If already at room temperature, let rise for about 30 minutes, or until puffy. Spray a sheet of foil with nonstick cooking spray and loosely cover the rolls, oiled-side down. Bake until just firm to the touch, about 30 minutes. Uncover, brush with the 2 tablespoons melted butter and sprinkle with the remaining 1/2 cup cheddar. Continue baking, uncovered, until the rolls are golden brown and the cheese is melted, about 20 more minutes. Let cool at least 20 minutes before serving. Another make-ahead option: Parbake, covered, for 30 minutes, then let cool and refrigerate overnight. Bring to room temperature, brush with the butter and bake, uncovered, 40 minutes, sprinkling with 1/2 cup cheddar during the last 15 minutes. Those rolls look amazing! With all the holiday leftovers, these would make great sandwiches. Could I substitute leftover mashed potatoes for the russet? I haven’t tried it but that should work! These chedder rolls look delicious! Mmmm…there’s really nothing better than fresh homemade bread! I totally agree with homemade bread being the perfect stress buster! 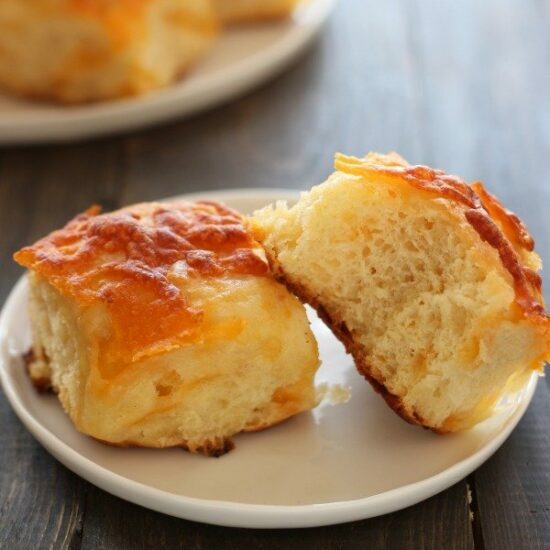 These look just perfect, cheese topped rolls are some of my favourite things ever, I can totally carb overload on them!! I made these today and they were wonderful! So tender and soft, just melt in your mouth good. Have you tried to freeze the balls after shaping? Snowed in and what do I do? I bake your cheddar rolls. I didn’t read your recipe carefully and shapes 15 instead of 24 rolls. Same baking time. 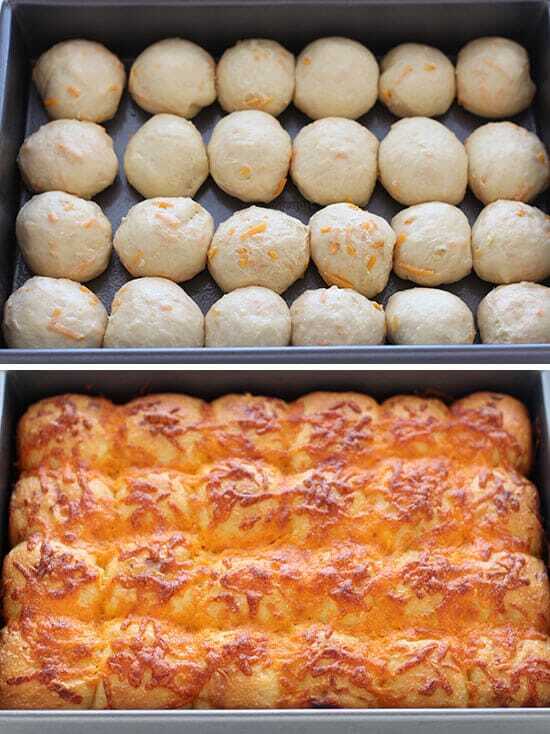 These are the fluffiest, softest, cheesy bread rolls ever!!!!!!! ❤️❤️❤️ them. In fact, all your recipes are great. Fantastic!! Thanks so much 🙂 Hope you kept warm all weekend. Would these work using sweet potato? Not a big fan of mustard. Can you taste it in the recipe? If so can I substitute something else? You can’t quite taste it as mustard, just helps to make them more flavorful. Often mustard is added to cheese sauces like mac & cheese to enhance the flavor. You can leave it out if you prefer though! These look awesome! I just got a stand mixer too, so these will be perfect to break it in (: how many eggs dos you use? The eggs are listed in the recipe – 2 large eggs! Could this be made gluten free? Hi, this has already been asked but not answered: How well does the dough freeze? I’m wondering how the cheese and raw eggs would fare. Thanks. I would follow the parbake instructions at the end of the recipe and then freeze instead of refrigerating. Defrost overnight then let come to room temp before finishing baking. I am a bread making addict and made this today, in a word “fantastic” soft fluffy sweet inside savoury top a real tear and share winner. I am not sure if I understand your measurements for the flour. My numbers 1 cup = 8 ounces. You are calling for 4 cups = 18 ounces? Explain please. Thank you very much! I was wondering if I could use potato flakes in place of the real potato? Any ideas? Thanks! Can I use strong flour as I would do when making bread. I was wondering if this could work in a bread machine, and if it could would anything would have to be done differently? I’m not sure, Rebecca! I don’t have a bread machine. Can these be made with instant potatoes? I have a LARGE group to feed! 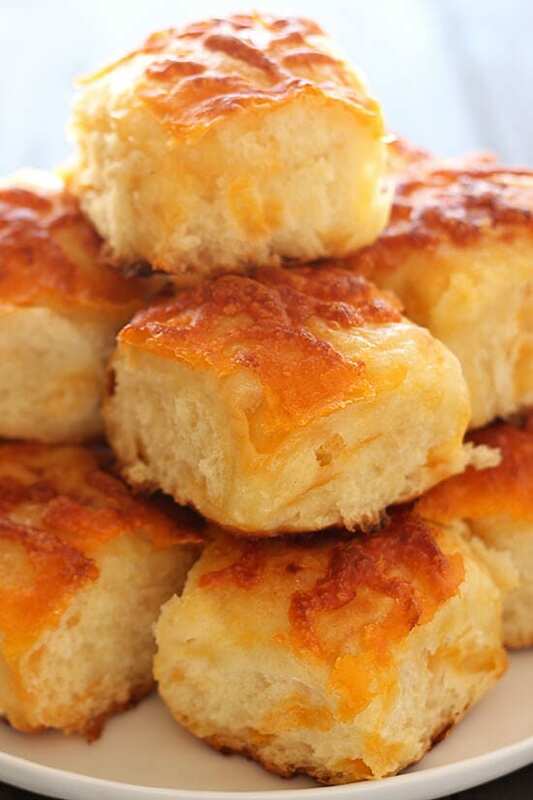 Omg – just made a batch of these and they are amazing little clouds of heavenly carby-cheesy goodness! I have been cooking/baking all my life and other than the fact that you use different types of measuring cups for dry and liquids I have never heard of the conversions you were talking about in regards to the flour. Can you explain where that comes from please? Do you have a gluten free option? Can i just substitute the 4 cups (18 ounces) all-purpose flour for gluten free all-purpose flour, potato flour or coconut flour?? Just looking to confirm the baking time(s) for the par-bake option. The standard recipe says to bake for 30 minutes, brush with butter and sprinkle with cheese, then continue baking for 20 minutes (a total of 50 minutes). The par-bake option says to bake for 30 minutes, chill overnight, bring to room temp, then brush with butter and bake for 40 minutes (a total of 70 minutes). Will the rolls brown overly much seeing that the second half of baking the par-baked rolls is twice as long as the second half of the baking time in the standard recipe? Do you cover the par-baked rolls with foil at any point during the 40-minute baking time? I made these rolls yesterday in between Tornado warnings, yes one trip to the Storm cellar in between second rising and baking. Thank goodness no damage in our neck of the woods. I did not have a Russet potato but a sweet potato was used instead and it was fantastic. I made myself an egg, cheese and bacon sammie out of this bread this morning and the bread was so soft. Most impressed Ma’am with your recipe. 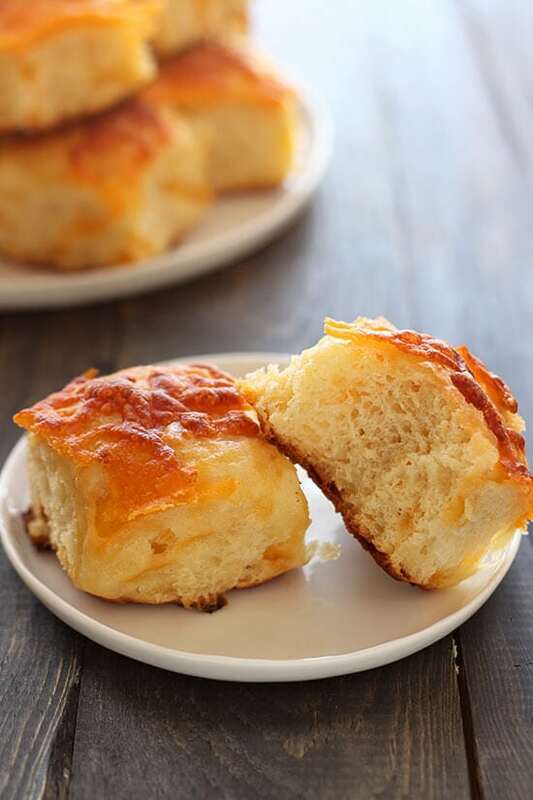 These look amazing and I get weak in the knees for all kinds of bread, yeast rolls r my fave! But I still look for a special roll recipe for Thanksgiving every year since the local bakery closed. I’ll let you know how they turn out. I subscribed so I can get the free ebook! Thank you for your generosity. Hi…recipe looks great. Question. Can you shape this into a bread pan for a loaf of bread?? Perfection in the yummiest form! My only problem was a few picky people who don’t like cheddar. I opted to use Swiss cheese instead & was even able to “stuff” these delectably fluffy rolls by digging a small well in the center & adding onions & more cheese that way. 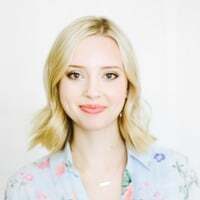 If you look at my profile picture here on Pinterest, you’ll see how I made them as a ring to be pulled apart by friends for a small get together. This recipe is so completely versatile, it’s DEFINITELY my new go to for anything party worthy! THANKS TESSA! Have you ever doubled this recipe I usually need about 4 dozen when family are over. Why not put the make ahead instructions at the end ? You have them in the middle , making the recipe jump all over the place .